Every year, the number of accidents due to reckless driving is gradually increasing despite the stricter rules and policies imposed by the government. This is partly because most of us are easily distracted by other things like our mobile phones. Well, answering a phone call or playing your favorite music requires you to shift your attention from the street to your smartphone. Thus, if you want to safely manage your device, you can just mirror phone to car. In this manner, you’ll be able to control and access your Android/iOS through your car and keep your focus on the driving instead of using the device. To know the steps, scroll down and see all the possible ways for you. 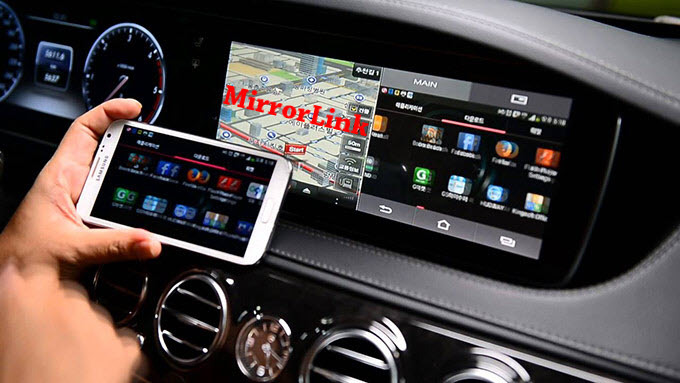 Android users can utilize MirrorLink to view their mobile devices on their cars. This is a popular car tech which you can rely on when you’re in need of mirroring app. It operates on your phone background and you will see the display on your dashboard while the audio will be played through your car’s speaker. With the help of this, you can easily open navigation, music, and other apps installed on your phone while making sure that you can keep your safety properly. Moreover, it provides you an easy way to turn your blinkers on. Follow the steps below to mirror phone to car screen. 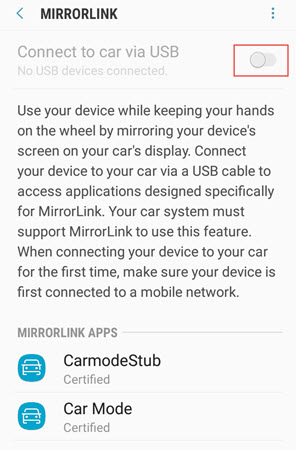 Not all cars and Android are MirrorLink-enabled, so before you proceed, check if yours is supported by this app. You can check the official website of MirrorLink for the list of compatible ones. Now, locate the USB port on your car and plug your Android with a USB cable. On your Android, go to “Settings” and find “MirrorLink” option. 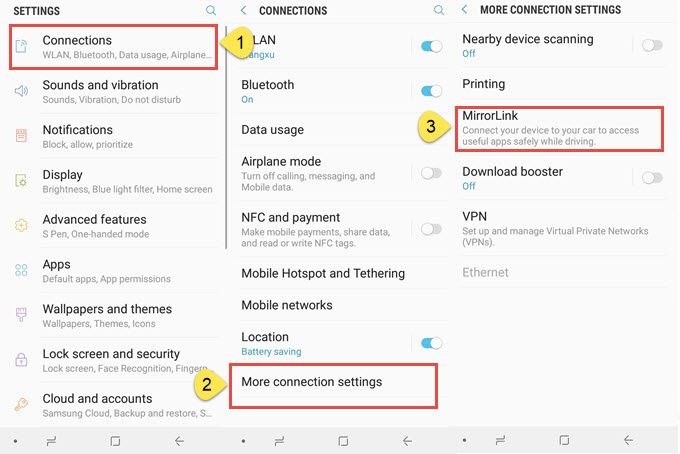 Take Samsung for example, open “Settings” > “Connections” > “More connection settings” > “MirrorLink”. After that, turn on “Connect to car via USB” to successfully connect your device. In this way, you can mirror Android to car with ease. Apple launched CarPlay to help drivers integrate their car’s infotainment system with their mobile gadgets. It is capable to run selected iOS apps like iMessage, Maps, Audiobooks, Podcasts, and many more. If you have an iOS device at hand and want to play iPhone in car, you can use CarPlay to mirror iPhone to car display. Thus, even when you’re driving, you can ring someone or listen to your music and audiobooks. The Maps application allows you to smoothly steer around your place. Additionally, it can predict traffic as well as suggest an alternative and more optimal route to you. To make driving safer, Apple incorporates Siri so that users can control their phones using the voice recognition tech. Like MirrorLink, CarPlay projects your screen to the dashboard and utilizes your car audio system for projecting the incoming sound. Let’s take a look at how to mirror iPhone to car screen. 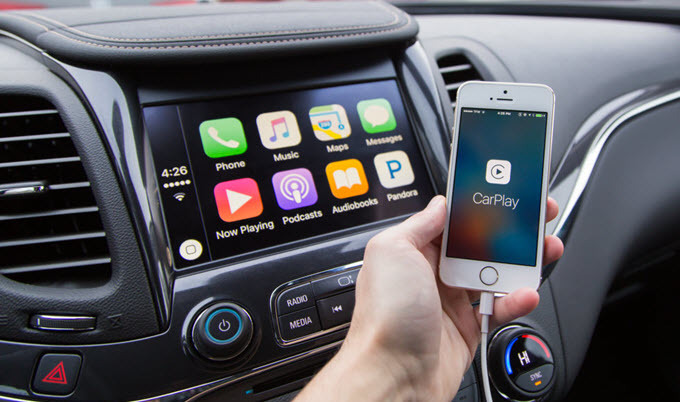 Make sure that your car is supported with CarPlay and you are in the place that supports CarPlay. Please make sure you have an iPhone 5 or later to use CarPlay. Now please enable the Siri voice control on your device. 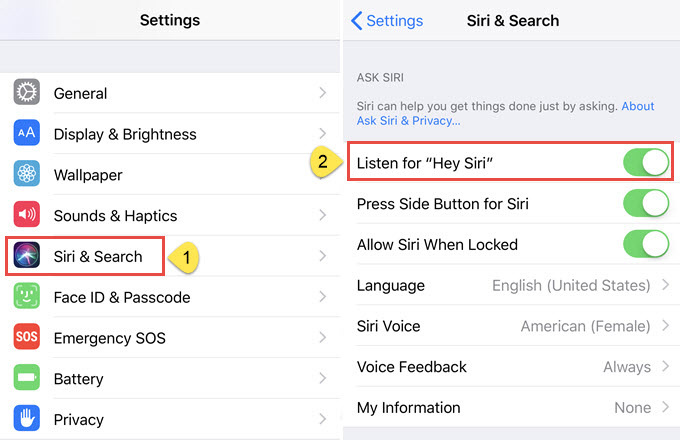 Simply go to “Settings” > “Siri & Search” and turn it on. For wired connection, please plug your iPhone into the USB port of the car with a smartphone or CarPlay icon. Suppose you still cannot see the CarPlay Home screen, you can tap the CarPlay logo on your car’s display. 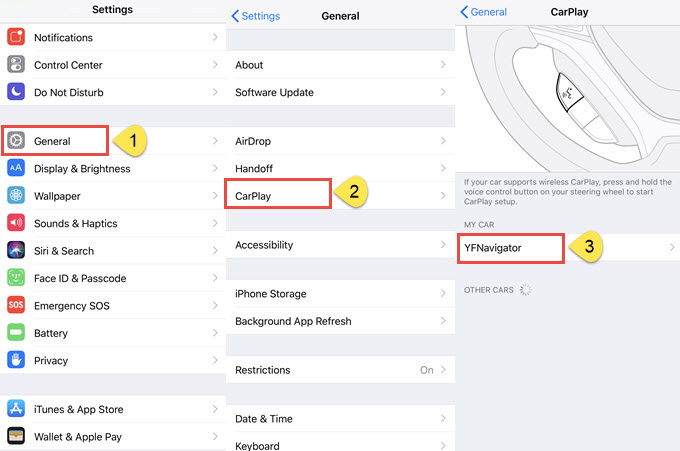 For wireless connection, if your car is compatible with wireless CarPlay, you can press and hold the Voice Control button on the steering wheel to set up CarPlay. Or turn on the Bluetooth pairing mode on your phone. Afterwards, open your iPhone, proceed to “Settings” > “General” > “CarPlay” and then choose your car. Run your car while using it. Now you can either press and hold the “Voice Control” button from your steering wheel or touch and hold the Home button in CarPlay on the Car’s touch screen to activate Siri. Another way is through the use of Wi-Fi mirror car adapter. 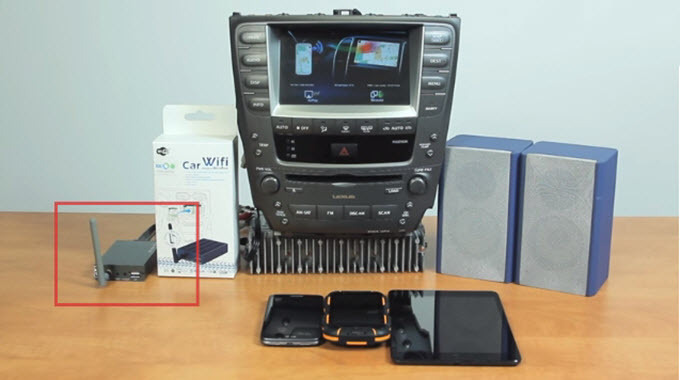 This device is designed to connect your Android or iPhone to your car. Actually, it can stream all the content of your mobile phones to your automobile. Hence, you can play audios or videos and display navigation maps and other applications stored on your smartphones. Meanwhile, it automatically detects the formats you use and provides the corresponding signal for your monitor. Plus, fixes the problem with regards to car units that support only one format. Luckily, there are many available adapters and most of them support Android running 4.2 version or higher and iOS 6, 7, or higher. 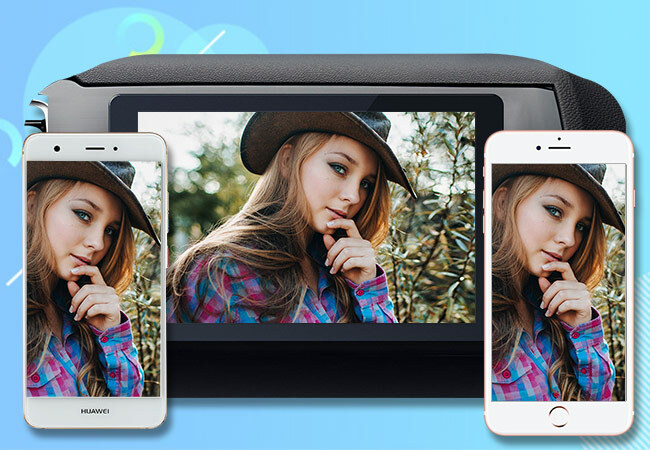 Here’s how to use this smartphone mirroring in car. Connect the mirror box on your car using the wires from the device. Once connected, navigate on your car display and press the “Input” until the image from the mirror box is displayed. Now, activate the Aux input and connect your device or tablet to your car. For Android devices, go to “Settings”> “Display”> “Wireless display”> Activate. Select the ID of your device to connect. For iOS users, turn WiFi on and connect your iPad/iPhone to the ID of your device. Swipe up from the bottom of your screen to open “Control Center” > “AirPlay” > “Hotspot” > “Activate Mirroring”. If you’re done mirroring, simply turn off the wireless display on Android and the AirPlay mirroring on iOS. To avoid any incoming danger while you are driving, you can use the above-mentioned tools to mirror phone to car screen. These can help you be alert and aware of your surroundings while controlling your phone. Hello. I have a toyota aygo and a Leeco s3 android phone. I live in Greece. Can I mirror my phone to the car??? Dear Marianna, to mirror android device to car screen, please kindly refer to method one in this guidance and also the third section "other feasible ways". If you have any other questions, please be free to reach out again.